You can improve your singing faster when you determine your vocal range and voice type with our online test and instructions. View the instructional video and read the article below. 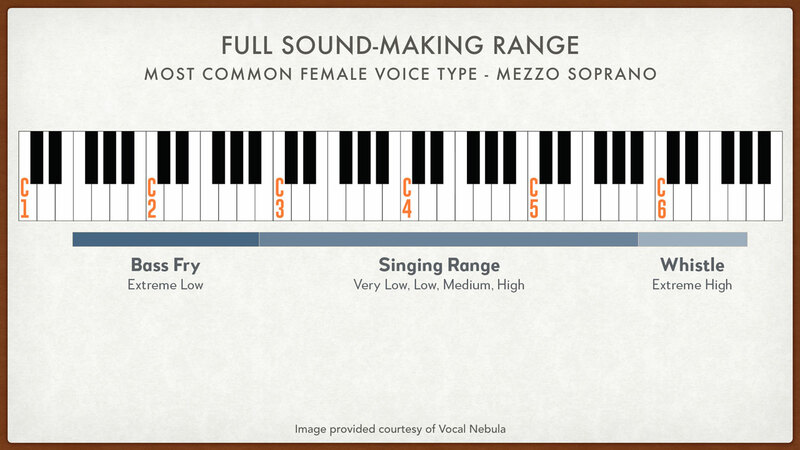 Measure your vocal range and voice type as instructed, preferably with a keyboard or piano. If you don’t have a keyboard, use the videos below. Compare your measurements to the table of voice types below. There is a common assumption in singing based on the experience of nearly every singer that the voice does not move smoothly and evenly from the lowest note to the highest. We all experience a feeling of “regions” or “sections” within our singing range that operate differently than other regions. These areas are often referred to as “registers” of the voice. These registers sit adjacent to each other over a spectrum from low to high notes, as if laid out on a piano, and, as such, will have a transition point located where we move from one register to the next. There is no consensus on how many registers a voice has or what to call them and this is often a source of contention. I will speak here from personal experience with my own voice and will use examples from the excellent book, “The Four Voices of Man”, by Jerome Hines. Most of us have heard of the simple division into “chest voice” and “head voice”. This model usually has a section called “middle voice” that some call “mix voice”. 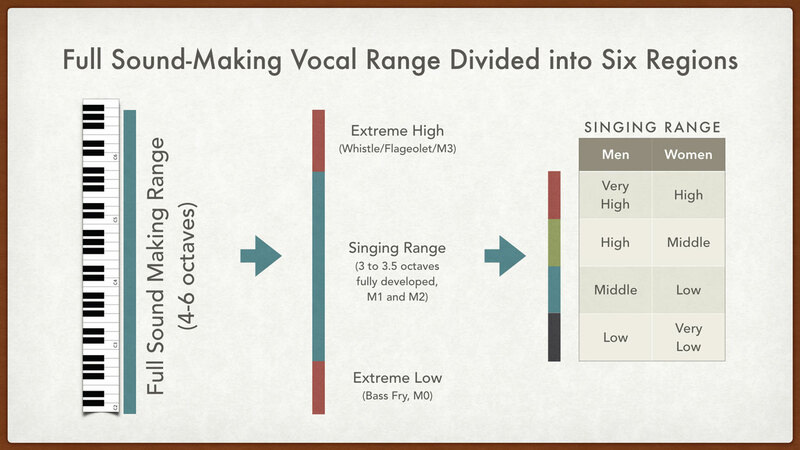 I prefer a more expansive model that divides the voice into six ranges,— extreme low, low, middle, high, very high and extreme high. See further below for tables related to where these ranges typically fall by voice type. This range begins where we can first make tone of any kind and ends where we can just begin to sing. It is often referred to as the “Bass Fry” register. In academic research, it is referred to as “laryngeal mechanism 0”, or “M0”. At the opposite end of the spectrum is the extreme high register, also called “whistle register” and “flageolet”. In academic research this register is referred to as “laryngeal mechanism 3”, or “M3”. These two extreme registers are characterized by, a) the inability to sing (whistle is not singing! ), and b) the inability to articulate words. As such, they are part of our full vocal range, but not part of our singing range. Since we are only concerned with our singing range in this exam, we aren’t going to measure where the extreme low begins or where the extreme high ends, only where they connect to the singing range. This range begins where we can comfortably sing a low note and articulate words. It is more of a small gray area than an exact point. This register ends where you encounter the passaggio to your middle voice. Men are most comfortable singing in this register. This is a small range for men relative to women. It is the range that sits between our two main passaggios. This is sometimes called the “mix register” or “zona de passaggio” (the passage zone). The lower passaggio to this register is easier to navigate than the higher passaggio. Our high range is where we sing our big money notes. For standard baritones, for example, this would be from E4 to G4, maybe to A4. This area is always under-developed in beginning male singers. In the high range we can still enunciate well. For most men, considerable training is necessary to smooth out the passaggio at the start of this register so that our voice blends nicely from our middle voice to our high voice. Not all men want or need to sing in the extreme high range. In this range we are unable to articulate as clearly as in the high register, though beautiful and highly emotional sound can be made. This range begins where you can comfortably sing a low note and articulate words. This register ends where you encounter the passaggio to your low voice. Women do not usually sing in this register nor care to develop it. You may encounter some difficulties measuring down here. This is a smaller register for women relative to men. Women are most comfortable singing in their middle and high registers and some will work to develop their low voice, too. The middle voice for women sits between their 2nd and 3rd passaggio, though please note that because women don’t often develop their low voice, a coach may refer to these passaggios as the 1st and 2nd passaggios. This is the “zona de passaggio” for women. In our model this is the top end of the female singing range. 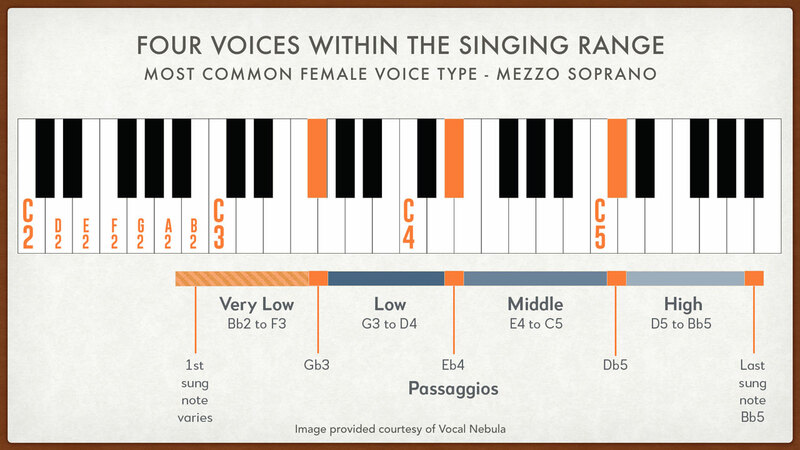 Women are most comfortable singing in their middle and high registers. Divisions between registers are called “passaggios” or “bridges”. You will take note of your own as you complete the steps below. Passaggios are known as areas where a discomfort is felt, usually a build up of tension and pressure, requiring a change in singing posture. Proper technique allows us to eventually navigate these passages with ease. 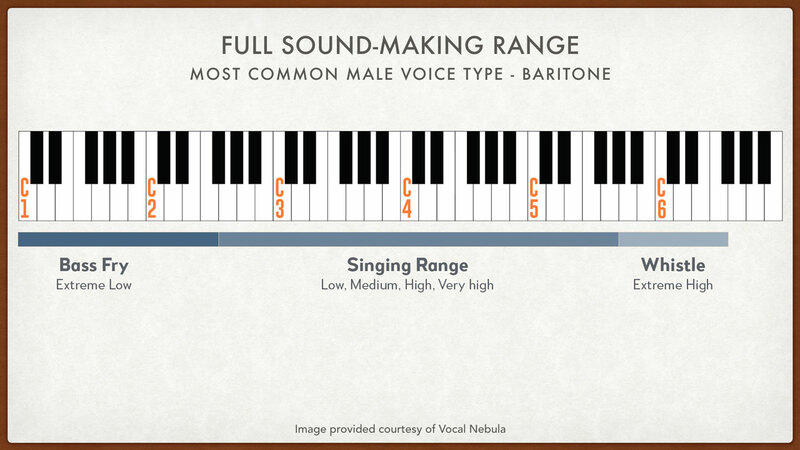 You should now have all you need to conduct your own vocal range test. Please remember that this is not an exact science. Some voices are easy to classify and some are not. Further, a beginning singer’s voice is harder to determine because they don’t yet have the technique necessary to sing well and false readings are possible. Different volumes, different vowels, etc., can make it seem as the passaggios move slightly up or down. These measurements can be taken again from time to time. As your voice develops the passaggios become more obvious and easy to locate (even after you’ve blended your registers, because you simply become more sensitive to your voice over time). As for your “voice type”, again, for some this will be more obvious than others. A good coach may be necessary to hear the characteristics of tone and timber needed to establish a type. 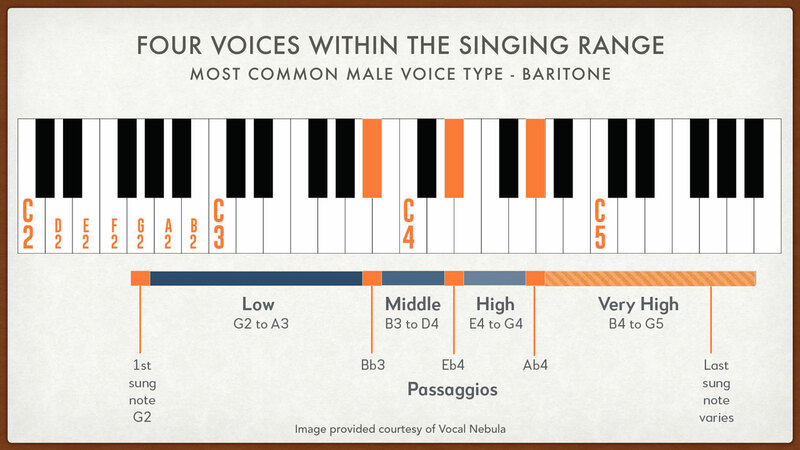 However, the most determinant factor of voice type is still the vocal (singing) range and location of passaggios. 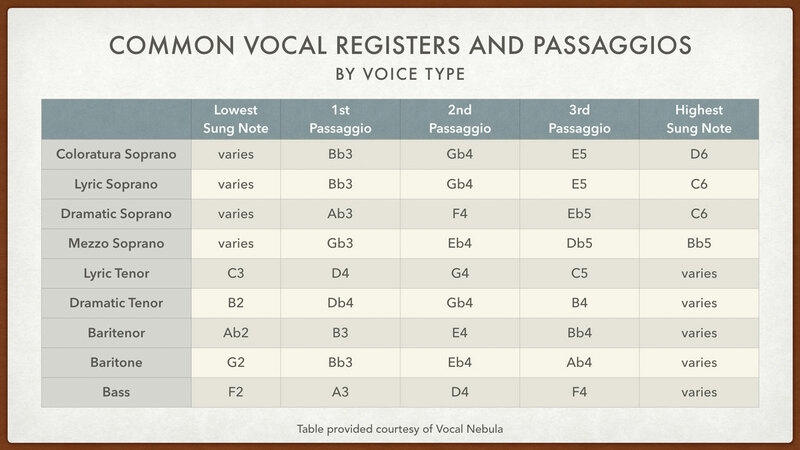 Use the table below to find your likely voice type based on the vocal range of your singing voice. You can use the ascending and descending piano scale in the videos above to test your vocal range (the singing range portion) if you don’t have access to a keyboard or piano. You will likely need to play the video several times in order to take accurate measurements. I hope you got value from this article and learned something new. As always, you can send me any questions through the contact page. You are invited to share this page to Facebook or any other preferred social site so that others can test their vocal range, too. It will also help us spread the word of Vocal Nebula, too. Thank you.